With its towering mountain peaks, twisting ribbons of smooth tarmac and crisp mountain air, Lake Tahoe presents the perfect locale for the first drive of the all-new 2016 Kia Sorento. More capable than ever before with increased towing capacity, more room for passengers and their gear and a newly available turbocharged engine, the 2016 Sorento owes many of its design inspirations to the highly regarded Cross GT concept that was unveiled in 2013. Kia’s design and engineering teams focused on a stronger body structure, delivering premium-grade NVH reduction and providing the driving confidence to enable the active lifestyle CUV owners covet. Sorento buyers have their choice of three engines, including a new 2.0-liter turbocharged four cylinder, the silky smooth 3.3-liter V6 and an improved 2.4-liter normally aspirated inline-4. Standard premium features and luxurious amenities will be available across five trim levels – L, LX, EX, SX and SXL – when U.S. sales begin in January, 2015. Reimagining the Sorento was no easy task for Kia’s designers, as the previous generation was lauded for its exceptional design. Not unlike the sophisticated Cross GT concept, which debuted at the Chicago Auto Show in 2013, the new Sorento finds some of its design inspiration in nature, as well as in the journey to nature’s outdoor adventures, revealing a vehicle of exceptional exterior presence that is larger than the outgoing model in nearly every way. Overall, the all-new Sorento takes on a brawnier, more planted stance, communicating its edginess and rugged personality. The clean profile is easily recognizable as Sorento, enhanced with stronger shoulders and a long hood to deliver a more aerodynamic and sleek appearance. Combining a significantly longer 109.4-inch wheelbase (up 3.1 inches) and overall width that’s broadened to 74.4 inches (increased by 0.2 inches), the Sorento’s packaging is more efficient and allows for greater interior room. The aggressively styled front end, with its narrower headlight design, is an evolution of the upper fascia seen on the Cross GT concept and bears a strong family resemblance to the all-new highly praised Sedona multipurpose vehicle. Distinctive LED positioning lights set the Sorento apart from others in the midsize CUV segment. Sitting below the headlights, the lower intake and fog lamp pockets are more prominent, creating a sportier appearance, which blends harmoniously with the overall design proportions. Premium enhancements include available LED rear dimensional tail lamps and LED fog lamps. The Sorento’s muscular body sits atop four new alloy wheel designs ranging from 17 to 19 inches, depending on trim level. 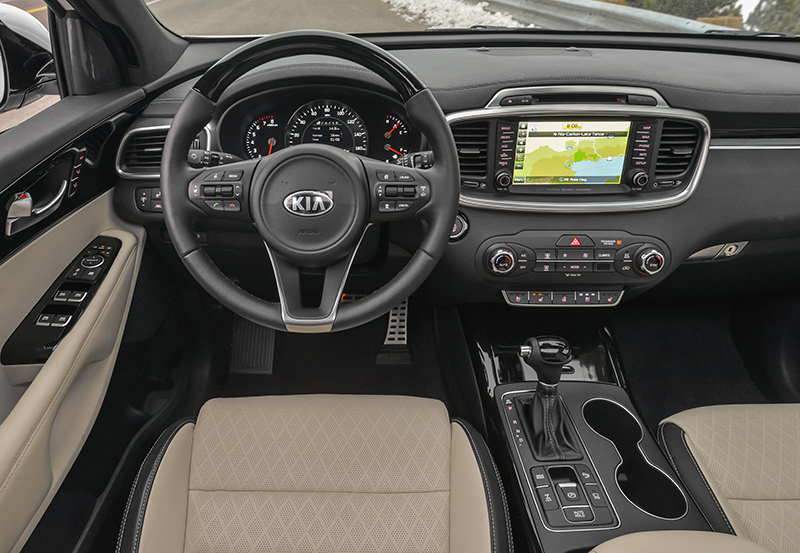 With an overall interior theme focused on the stability of a horizontal plane, the design motif provides a strong foundation for the premium textures and high-quality materials found throughout the 2016 Sorento’s cabin. The liberal application of soft-touch materials is particularly evident around the instrument panel, center console and door panels. Depending on trim level, the ready-for-adventure 2016 Sorento comes with standard 40/20/40 second-row folding five-passenger (4-cylinder models) or 50/50 folding third-row seven-passenger (V6 models) seating configurations. The seating system of the new Sorento is designed to offer optimum comfort and ideal seating positions to fulfill the needs of every occupant. For added luxury, also available are heated and ventilated front seats, heated rear seats, 14-way power driver and 8-way power passenger seats, driver’s seat thigh extension, a 4-way headrest with one-button adjustment, dual-zone HVAC and Kia’s second-generation panoramic sunroof, as well as available premium Nappa leather trim seating surfaces, similar to those found in Kia’s luxury flagship sedan, the K900. Second- and third-row passengers will enjoy enhanced comfort thanks to a 0.5-inch increase in rear passenger space for both rows and a roomier flattened second-row center floor. Access to third-row seating is improved with 1.5 inches of additional boarding space, while headroom throughout the cabin is also increased. 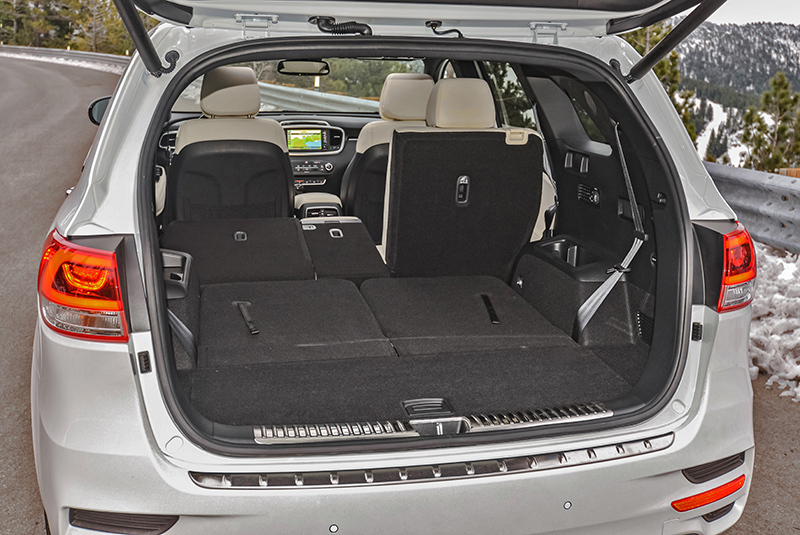 Overall cargo volume in the new Sorento increases from 72.5 cu.-ft. to 74 cu.-ft., while cargo volume behind the 3rd row increases from 9.1 cu.-ft. to 11 cu.-ft., providing increased space for essentials and active-lifestyle equipment without sacrificing rear-passenger room. In addition, an easy-folding lever allows various seating arrangements, flexible luggage space and greater overall versatility. Users can fold the second-row seatback without opening the rear door by pulling the lever mounted on the luggage-area side trim. This feature allows quick and easy loading of large cargo. 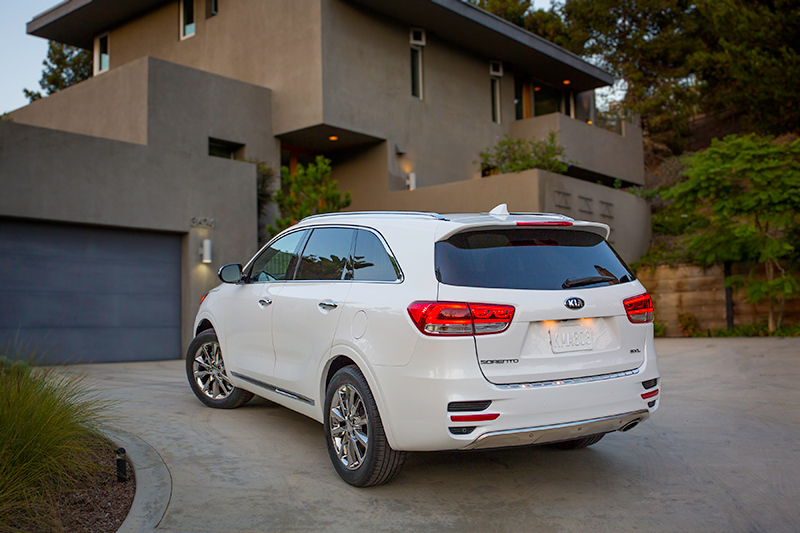 The available premium sound system is well suited to Sorento’s now-more-upscale interior environment. Piping in music from an available 630-watt, 12-speaker Infinity®2 stereo system with an 11-channel amplifier, audiophile sound has gone mobile in the Sorento with the addition of Clari-Fi technology. Clari–Fi works in real-time to rebuild audio details lost in digitally compressed music via an algorithm that intelligently and seamlessly reconstructs the material to restore to the listening experience, regardless of the source. With Clari-Fi, music sounds cleaner, crisper, wider and more dynamic. New in the 2016 Sorento, four additional UVO eServices are now available: Geo-fencing, Speed Alert, Curfew Alert and Driving Score3. Additionally, with the introduction of the Kia App store4, select apps can be downloaded for free from iTunes®5 or Google PlaySM6. The Kia app connector is now available for partnership with the content community for downloading apps such as Yelp®7, while Soundhound, Pandora®8 and iHeart® Radio9 (late availability) come preloaded. Many more new technologies for comfort and convenience are featured in the new UVO system, including Siri® “Eyes Free”5 and Local Search – powered by Google® – for finding locations, addresses and points of interest. Sirius XM Travel Link10, offering access to traffic, weather, fuel prices, sports scores, stock information and movie times, keeps you well connected while taking those weekend excursions in the Sorento. Accessed through a crystal-clear 8-inch capacitive-touch color screen, the available navigation11 system features SD card storage for MAP DATA and USB 2.0 support for high-speed updates as well as integrated rear backup camera12, Bluetooth®13 hands-free support and UVO voice recognition. A 4.3-inch TFT color touch screen is standard and also incorporates Bluetooth, and UVO voice recognition capability. The core of the all-new 2016 Sorento is its significantly modified platform. The enhanced structure increases torsional rigidity by 14 percent over the previous generation. Fifty-three percent of the unit-body consists of advanced high-strength steel, a 115 percent increase over the outgoing model. Liberal application of industrial strength adhesives, the use of dual-seal lip joints as well as large diameter and laser welding techniques combine to make the 2016 model the most robust Sorento ever. The all-new 2016 Sorento offers a number of safety features, including seatbelt anchor pretensioners and six airbags, to help give drivers the confidence and peace-of-mind they need when motoring with their friends and loved ones on the nation’s highways and bi-ways. All Sorento models come standard with active safety features such as Electronic Stability Control (ESC)14, Traction Control System (TCS)14, Brake Assist System (BAS)14, Hill-start Assist Control (HAC)14, Electronic Brake Force Distribution (EBD)14 and Antilock Braking System (ABS)14. Additional technologies such as Roll Over Mitigation (ROM)14 and Cornering Brake Control (CBC)14 on AWD models also were added as standard equipment for improved dynamic control and safety. New available driver aid technology, including Vehicle Stability Management (VSM)15, Forward Collision Warning System (FCWS)15, Smart Cruise Control (SCC)15, Blind Spot Detection (BSD)15, Rear Cross Traffic Alert15 and Surround View Monitor (SVM)15, help provide Sorento owners with a more convenient daily driving experience. The 2016 Sorento combines a strong base with additional design improvements to reduce NVH and provide a comfortable and quiet interior environment. Updates to the rear suspension include a redesigned rear cross-member span that’s longer than the outgoing model for improved wheel travel over harsh roads and revised bushings to help reduce road noise. Vertically mounted rear shocks contribute to a comfortable ride no matter what the driving conditions. Up front, the Sorento’s revised suspension geometry and responsive steering system result in a quick and nimble behind-the-wheel feel. Ride and handling are optimized with the application of an “H” shaped subframe, four-point bushing mountings, and Hydraulic Rebound Stopper-type shock absorbers. The available Rack-mounted Motor Driven Power Steering (R-MDPS) features direct mounting of the electric motor on the steering rack, enhancing steering response and improving handling. Sorento continues to offer an advanced AWD system that automatically routes power to the wheel with the most traction. When conditions call for more sure-footed capability, the 4WD Lock Mode splits engine power evenly between the front and rear drive shafts. The system also provides drivers the added stability of Torque Vector Cornering Control (TVCC). The TVCC system is activated when yaw and steering sensors detect unwanted understeer. The spirited front- or all-wheel drive experience is brought to life with a choice of three engines, including a 2.4-liter inline-4 GDI, a 3.3-liter V6 GDI and a new 2.0-liter inline-4 GDI turbocharged powerplant. The 2.4-liter engine, with new Electronic Intake Continuously Variable Valve Timing (E-CVVT) delivers a capable 185 horsepower. 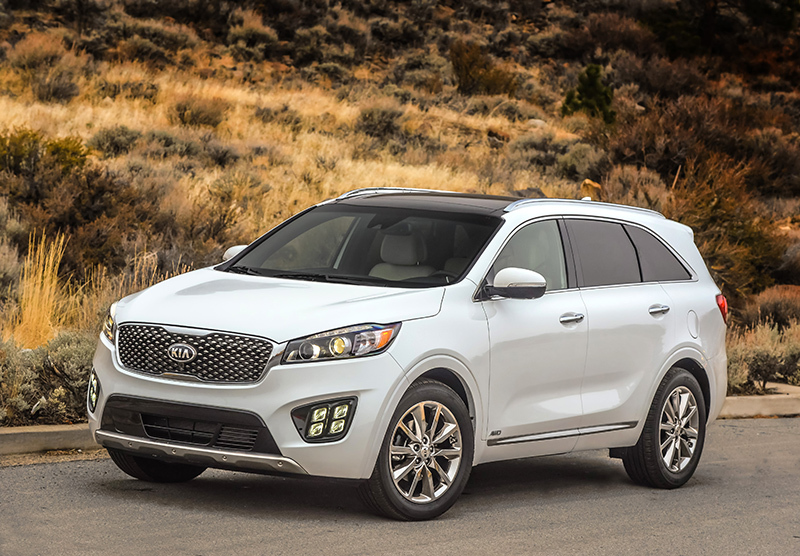 On the other end of the engine range, the Sorento’s V6 gallops to the tune of 290 horses on the open road and with that power, the Sorento is now able to tow up to 5,000 lbs when equipped with AWD. In the middle, the new turbocharged I-4 provides a best-of-both-worlds scenario, making a stout 240 horsepower while also delivering commendable fuel efficiency16. All three engines channel energy through an electronically controlled six-speed automatic gearbox featuring Sportmatic® shifting. Content and images provided by: Kia Motors America, Inc.